Wide Asleep in America: Iran's Nuclear Rights vs. the West's "Bombastic Diplomacy"
Iran's Nuclear Rights vs. the West's "Bombastic Diplomacy"
U.S. Secretary of State John Kerry and Undersecretary Wendy Sherman meet with EU High Representative for Foreign Affairs, Catherine Ashton and Iranian Foreign Minister Mohammad Javad Zarif in Geneva, November 9, 2013. Reports following the end of the most recent round of talks between six world powers and Iran in Geneva early Sunday morning revealed that, while a preliminary deal was close at hand, the failure to produce a workable agreement was due to unnecessary, last minute intransigence by the French delegation, led by Laurent Fabius, France's foreign minister. Fabius, much to the ire of the other diplomats present (which included Secretary of State John Kerry, the foreign ministers of Russia, Britain, and Germany and the Chinese deputy FM), reportedly "blocked a stopgap deal aimed at defusing tensions and buying more time for negotiations," the draft text of which would have established the slowing down or stopping of aspects of the Iranian nuclear program in exchange for limited sanctions relief. The French foreign minister also broke the agreed upon diplomatic protocol for the talks by "revealing details of the negotiations as soon as he arrived in Geneva on Saturday morning, and then breaking protocol again by declaring the results to the press before Ashton and Zarif had arrived at the final press conference." According to The Guardian's Julian Borger and Saeed Kamali Dehghan, "Fabius said one of the key issues was Iran's heavy water reactor at Arak, which is due to reach completion next year after many delays. The west and Israel have called for construction work to stop as part of an interim deal aimed at buying time for negotiations on a more comprehensive long-term deal." But the focus on the Arak facility, a half-built heavy water reactor routinely used by Israel and its contingent of hawkish American supporters as an alternate way to fear-monger about Iran's nuclear program, is disingenuous. The facility itself has been plagued by technical setbacks and delays and won't be operational until mid-2014 at the very earliest. Whenever it is finally commissioned, it will be used for medical, scientific and agricultural research. Heavy water reactors pose a potential proliferation threat due to the amounts of plutonium produced as a byproduct of their spent nuclear fuel, material that could then be separated from the irradiated fuel and further processed to weapons-grade levels. Yet scuttling a deal due to concerns over hypothetical and highly unlikely scenarios makes no sense. Beyond the fact that Iran has repeatedly denied any intention to weaponize its nuclear program and that all American and international intelligence assessments consistently affirm that Iran has no nuclear weapons program, the alarmism over Arak relies on a deliberately decontextualized and incomplete presentation of reality. For example, the heavy water reactor at Arak is subject to IAEA safeguards and is routinely visited by its inspectors. This will continue to be the case once Arak comes online. Also, as Bloomberg News reported back on June 6, 2013, "Iran encouraged United Nations nuclear monitors to use powerful new detection technologies to dispel international concern that the Persian Gulf country is seeking to build atomic weapons." "We always welcome the agency to have more sophisticated equipment, to have more accuracy in their measurements, so that technical matters will not be politicized," Iranian Ambassador to the IAEA Ali Asghar Soltanieh told the press in Vienna at the time, adding that Iran "won't object to IAEA monitors using new technologies to determine whether plutonium is being extracted from spent fuel at its new reactor in Arak." [T]he reactor at Arak would need to be operational for perhaps up to a year before the plutonium could be extracted. Even then, Iran does not have a reprocessing facility for separating the plutonium to produce weapons-usable material, having revised its declaration to the IAEA regarding the Arak site in 2004. The revision eliminated plans for a reprocessing facility at the site. Tehran maintains that it does not intend to build a plant to separate plutonium from the irradiated fuel that the reactor will produce. Reacting to the recent reports from Geneva, Kimball, who is ACA's executive director, said that, if anything, "Arak represents a long-term proliferation risk not a near-term risk and it can be addressed in the final phase of negotiations," adding, "France and the other... powers would be making a mistake if they hold up an interim deal that addresses more urgent proliferation risks over the final arrangements regarding Arak." It appears that France has done just that, in a move met with elation by Congressional hawks, Israel and Arab dictatorships, with whom France recently inked billion dollar weapons deals. Nevertheless, American officials are now seeking to peg Iran, not France, as the intransigent party, in an effort to placate an increasingly shrill Israeli government worried that diplomacy might actually work and the possibility of war will diminish. In an article published online Sunday, the New York Times claimed that "the Iranian government's insistence on formal recognition of its 'right' to enrich uranium emerged as a major obstacle" at the Geneva talks. While the article notes that the "Obama administration is prepared to allow Iran to enrich uranium to the low level of 3.5 percent as part of an interim agreement," it omits the inconvenient fact that the United States does not have the authority to "allow" or "disallow" anything when it comes to Iran's nuclear program. Iran's inalienable right to a peaceful, domestic nuclear energy program is affirmed by international law via the Nuclear Non-Proliferation Treaty (NPT). As Fred Kaplan recently wrote in Slate, "So, when the Iranians insist on their 'right' to enrich uranium for peaceful nuclear energy, they aren't asserting some self-contrived privilege; they are quoting the NPT." Iran's inherent right to enrichment and indigenous fuel-cycle technology is actually quite clear and uncontroversial. The vast majority of the international community - including China, Russia, Brazil, Turkey, India, South Africa, and all 120 members of the Non-Aligned Movement - acknowledges this right. Even former IAEA Director General Hans Blix has, for years, acknowledged this right. In 2005, Blix noted, "When the U.S. says that it is unacceptable for Iran to have enrichment capacity, well I don't think that quite squares with the Non-Proliferation Treaty that permits it," adding, "They are within a legal right to do so." 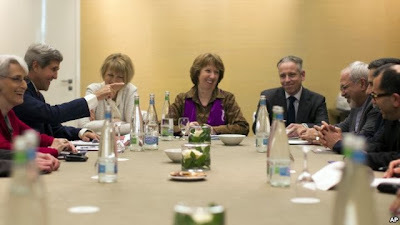 Just this past September, Blix again stated, "Iran is right, in my view to insist that under the NPT, to which it is a party, it has a right to enrich uranium for peaceful uses, but the treaty does not impose a duty on any party to enrich." He continued, "Iran is free to decide unilaterally whether and how much it wishes to enrich." The United States, however, "is not prepared to acknowledge at this point that Iran has a 'right' to enrich." Undersecretary of State for Political Affairs Wendy Sherman, who is leading the U.S. delegation at the nuclear talks (as long as John Kerry isn't in the room), denied Iran's right to enrich uranium during testimony before the Senate Foreign Relations Committee last month. "It has always been the U.S. position," she told Florida Senator Marco Rubio, "that Article IV of the Nuclear Non-Proliferation Treaty does not speak about the right of enrichment at all." Speaking to reporters in Geneva on November 6, an unnamed "senior administration official" insisted that "the United States does not believe there is an inherent right to enrichment, and we have said that repeatedly to Iran." He added later that "the United States does not believe any country has a right... We believe Iran does not have a right. We don't believe any country has a right." At a press conference in Abu Dhabi following the breakdown of this past week's talks in Geneva, John Kerry declared, "There is no existing right to enrich for anybody. The NPT does not grant a right and it does not prohibit a right." There are even more recent examples of American duplicity on this matter, however. In a 2009 interview with the Financial Times, John Kerry himself, then a Massachusetts Senator, stated that the demand - once pushed by the Bush administration and now maintained by Israeli Prime Minister Benjamin Netanyahu and his acolytes in Congress - that Iran have no enrichment capability is "ridiculous" and "unreasonable." "They have a right to peaceful nuclear power and to enrichment in that purpose," Kerry said. To claim otherwise was "bombastic diplomacy." Jordan and other countries have the right to develop and enrich their uranium deposits, U.S. Undersecretary for Nuclear Security Thomas D'Agostino said at a press briefing in Vienna. "We believe quite strongly that nations have the right to develop their civil programs for civil purposes," D'Agostino said when asked specifically about Jordan's nascent nuclear program. "We are not trying to tell other nations that you can't have enrichment." Wait, what? Read that again. The point here is clear. The United States believes it can dictate which rights countries are entitled to on a case by case basis. In fact, Undersecretary Wendy Sherman said as much at her recent Senate appearance. "The United States does not take [the] position" that enrichment is an inherent right of all nations, she said. "We take the position that we look at each one of these [cases]." This is piecemeal international law and the explicit obliteration of the equal application of law for all nations. Essentially, if you are a willing and pliant client of the United States, you have certain rights; if you're not, you don't. So, there is no sense to back to talks about enrichment. It's not the case... When there is a secular and democratic Iran, let them have all the technologies in the world, whatever they like. Not this regime. Not this regime, which despises the culture and the values of your society, if you don't know it. A month earlier, former CIA and NSA chief under George W. Bush, General Michael Hayden similarly confirmed that opposition to a nuclear-capable Iran has nothing to do with proliferation fears or international law, but rather regional hegemony and regime change. "It's not so much that we don't want Iran to have a nuclear capacity, it's that we don't want this Iran to have it," Hayden told a gathering of analysts, experts and journalists at the Center for the National Interest. "Slow it down long enough and maybe the character [of the Iranian government] changes." As long as the United States maintains the absurd position - inconsistent with international law and its own previously held policy - that Iran be denied its fundamental national rights, a diplomatic compromise will be unachievable. And that's exactly what spoilers like Netanyahu and his fans in Congress and on K Street are gunning for. You make it clear that the USA seeks to (or has already) make international law its private fiefdom: "La loi, c'est moi" -- and left unsaid is the "Apres moi le deluge" (appropriate on so many scores, especially the USA's refusal to address climate change. My own take is that the nations are all, these days, in effect, puppets for their masters, the oligarchs (CEOs of multilateral corporations) and that even the USA (in the persons of Obama, Kerry, et al.) have little power. What you hear when the USA speaks is the voice of BIG-MONEY. The US goal is regime change. They will never lift the sanctions even if Iran destroys all its nuclear program. Have we forgotten about the Iraq sanctions? Iraq destroyed all of its WMDs to no avail. Eventually, the Clinton administration declared that sanctions will remain as long as Saddam is in power. AAARRRGGGGHHHH, man, sometimes it's just too much to endure all these cliques who feel they can decide for everyone on the planet who's in and who is not 'in. 'And therefore dictate to other sovereign nations rules for which they themselves don't even follow. Israel rails against Iran getting the bomb while clutching several hundred of their own, while refusing to sign the Nuclear non-proliferation Treaty, and refusing membership in the IAEA, and hence IAEA inspections the USA sits back and covers for them and is complicit in their crimes against Palestinians, with their 4th largest world military thanks to the USA's $8 million/day to the Israeli cause of its security, its fight against Palestinians who have NO military. Something is wrong with this picture, why are not more people trying to stop this Israeli takeover of USA's Middle East foreign policy?